Do you have a teenager with an attitude? Shocked there! You must get them this 4 pack I Can't Even button pack. 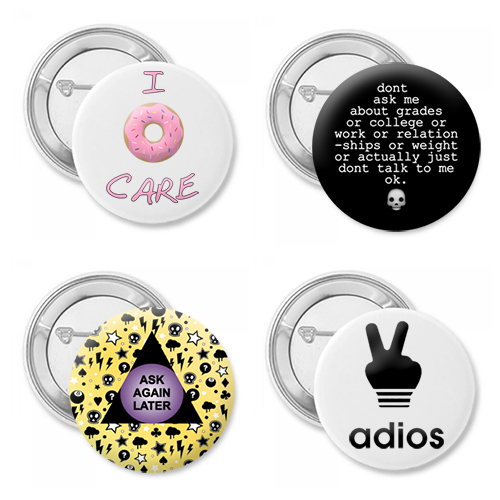 Button pack features an I donut care, don't talk to me, adios and ask again later. Attitude is in the mind of the beholder and sometimes the beholder wants to express those feelings without saying a word. These I Can't Even 4 pack set of buttons shows a new way to communicate those feelings. Set the trend among your friends and get all those annoying classmates to leave you alone. Perfect for your back pack and available in your choice of size. Each button comes with a pin backing.